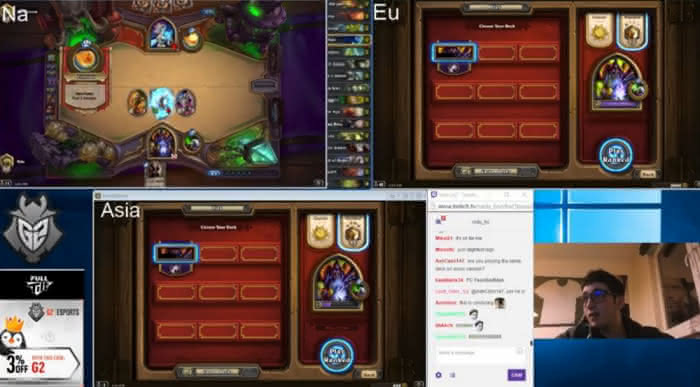 It looks like streaming multiboxed Hearthstone is going to become a regular occurrence, with both Rdu and Thijs streaming it in the last couple of days. Playing all three available servers at the same time helps the top players reach legend on all three faster. In turn, this helps their World Championship efforts, by giving them multiple chances to reach the top 100 and earn valuable World Championship Points. The first player to multibox Hearthstone on stream was Dog, over 6 months ago. The popularity of that stream led him to make this Reddit post on how to do it. Ryzen has also streamed three servers at once, choosing the daunting task of playing Oil Rogue, Mill Rogue, and Miracle Rogue simultaneously. Other than those two novelties, however, multiboxing had not been very common, until Rdu streamed his ladder climb on all three servers on Saturday. This struck more of a chord with top players, as they realised it would speed up the early season grind. On Sunday, Thijs also streamed all three servers at once, gathering many likes and retweets on Twitter. It seems that people are enjoying watching the multiboxing, and that it servers a purpose for the pros. It seems likely that we will see more of this at the start of every month.